Wow! This location is the real deal!! When I lived downtown The Ten Spot was the only place I trusted for brazillies and since moving to this area I was super apprehensive to test out other places. I mean, not exactly something you want to be 'testing out', right?! 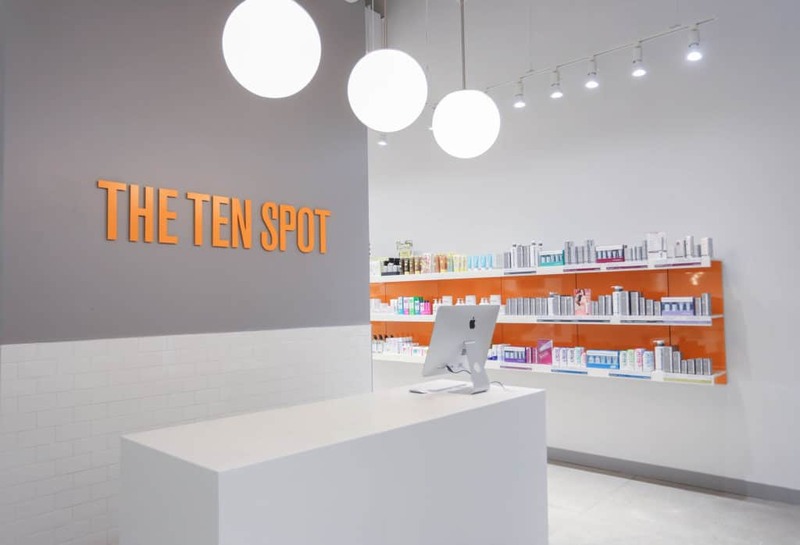 When I saw The Ten Spot brand pop up in Oshawa I was so excited as their standards are HIGH. This location is super bright, ridiculous clean, and has major positive vibes! I was sold the minute I walked in between Christina's incredibly warm greeting, as well as the attention they clearly put in to making this place as upscale as you'd want it to be. I received brazilly waxing services from Jot - who I can only describe as a waxing goddess. This lady is PRO! As we all know this service isn't exactly "enjoyable" but Jot's style is the epitome of what you'd hope for. Also gals - they have TVs in the waxing rooms to distract you. We got a whole episode of FRIENDS in and I loved it! Hair removal with a side of comic relief. I can honestly say Jot's techniques were top notch and I have never had such a painless experience. I'm not going to say it was COMPLETELY pain free as we all know what's going down but pretty darn close. Request this babe if you can! I'm excited to go back and try other services. Prices are super competitive for the level of service you're receiving and 100% worth every dime. Looking forward to becoming a regular! Absolutely loved my time at this location! The staff were amazing, and attentive. Engaging in conversation, and so welcoming. Their knowledge of products and all services they offer was fantastic. The relationship between owner and staff was phenomenal, the owner beamed as she spoke highly of all of the ladies there. I look forward to returning soon! HIGHLY RECCOMEND The Ten Spot Oshawa! What a nice clean fresh and fun surprise. Staff are super pleasant and knowledgable. I have learned SO much in my two visits already. A great way to invest a little time in yourself and it doesn't have to be a full on spa day - they even have a Quickie Facial - my new fave. Great place to book with friends - you can bring your own wine for mani pedis! Check it out and get treated like a TEN! Very clean and friendly environment. Great service. Will be going back for sure! Had a great time at the Ten Spot the other weekend! Went with a group of girls and we had so much fun getting our pedicures and manicures together. The Owner was very welcoming and staff was super friendly. They let us bring our own wine, which was so nice. Very happy with the services I received. I loved how clean the place was and will definitely be back. 5 star rating! I was in dire need of a facial due to some issues I was experiencing with my skin and I decided to give The Ten Spot a try based on all the positive feedback I’d seen lately since they’ve opened. I went in on Saturday, what a friendly team. They asked good questions to understand my needs and were not pushy in trying to sell me anything. I started with an awesome facial with Emily....I actually fell asleep which has never happened! Afterwards, she walked me thru some recommended products clearly indicating what was essential and what was extra if I was willing to put in the time. I loved the experience and highly recommend you give it a try! I adore the 10 spot. I've always had a kind, cleanly, and professional experience. If you are looking for somewhere that gives you a high end spa experience without feeling like you are breaking the bank, I'd definitely recommend. The staff are so warm and welcome and helpful. Just so happy overall. Had a pedicure done here and the staff is amazing! Extremely friendly all around. They're very series about hygiene which is what I was looking for. I will definitely go back to this place and recommend to others.